We all know that eating the right foods can make our skin great from the inside, but what about from the outside? Well, turns out you can! 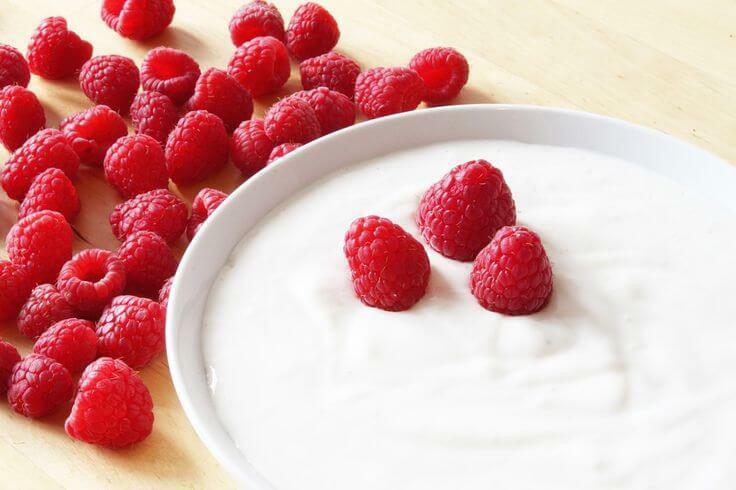 Yogurt has been used for years on both skin and hair. Besides being fantastic for your digestive system, yogurt can be a great base to any homemade mask to address a variety of skin issues. It’s smoothing as well as hydrating, which makes it perfect for a DIY facial treatment. It’s also anti-inflammatory, which means that it can calm down irritated skin and reduce redness. It’s also packed with tons of great nutrients. These include an Alpha Hydroxy (AHA) acid found naturally in yogurt called lactic acid. Lactic acid makes skin nice and soft. It is a light exfoliant, which means it rejuvenates your skin, overturning old skin cells and revealing healthy new ones. Yogurt (especially low-fat one), also contains zinc, which plays a role in fighting acne and controlling oil production. That said, it matters which yogurt you use in your Do-It-Yourself recipes. It’s important that you only use yogurt without added sugar or flavors. Sometimes what’s advertised as “plain” yogurt can have added flavors, so check the ingredients list before purchasing. Greek yogurt is best for those with dry skin, and oily skin types will benefit from low or no fat yogurt. As usual, if you have any specific issues (like allergies, eczema, etc. ), consult a dermatologist before trying any of these DIY skin treatments, and ALWAYS avoid the eye area when using these masks. If you are worried you might be allergic to a certain ingredient, do a patch test first to try it out before you apply it to your entire face. Finally, don’t use any of these masks more than once per week to avoid drying out or irritating your skin. You shouldn’t rub them in — just gently apply the mixture to your face. Since lactic acid may make your skin slightly more susceptible to sun damage, be sure to use sunscreen. As you probably know, olive oil is irreplaceable treat in many skincare routines. Mix it with avocado and yogurt, and you’ll get an ultimate remedy. If you’ve got dry skin, add some much-needed moisture to your routine by using this avocado-yogurt mask. The ingredients of this mask contain hydrating oils that will nourish your dehydrated skin! First, mash half an avocado and add it to a bowl. Spoon in one tablespoon of olive oil, then mix with one tablespoon of natural yogurt. Apply and leave on for fifteen minutes. Then, thoroughly rinse with warm water. If you’ve got red or upset skin that you want to calm down, give this cucumber and honey yogurt mask a godsend. Honey is often used in skin care because it’s a humectant, which means it’s an ingredient that works to rehydrate your skin. Combined with the calming ingredients found in cucumbers such as ascorbic and caffeic acid, your skin is in for a treat. Soothe your skin irritation with half a cucumber, one tablespoon of honey, and Greek yogurt. You’ll need to blend your ingredients to get a smooth consistency, then let sit on your face for 15 minutes. Rinse and enjoy your soft skin! You may have seen oatmeal pretty frequently in different DIY skin care recipes before. That’s because, like cucumber, it’s great at calming down your skin. It has anti-inflammatory properties galore – plus, it’s gentle enough for even the most sensitive skin. Using oatmeal in a DIY mask will leave your skin clean and stress-free. For this face mask, mix half a cup of hot water with a third of a cup of oatmeal. Stir it well and let it sit for a couple of minutes. Then, add two tablespoons of Greek yogurt and one small egg white. A little goes a long way — dab the mixture on your face, making sure not to glop it on. After 10-15 minutes, wash the mixture off. If you’re familiar with Ayurveda medicine, you’ll have heard of turmeric used as in skin care. It’s long been a natural remedy added to face creams and cosmetics in India. It’s an antioxidant and boasts of anti-bacterial, anti-inflammatory and even possibly anti-aging properties. Bananas are also a nice addition to the mask, as they contain loads of vitamins and nutrients. Turmeric is an amazing ingredient, but the color is extremely potent! If you have very light skin, be aware of this mask staining. If your skin is extra pale, consider leaving this mask on for only half the time, or use less turmeric. To make this mask, you’ll need half of a ripe banana (you can use the other half for making a smoothie or banana bread), one tablespoon of yogurt to mix, and one teaspoon of turmeric powder. Let set for 10 minutes and rinse in warm water. Use an old wash cloth to rinse, as it will stain, and consider wearing an old t-shirt while doing the mask. If you want to make your mask extra brightening, add a teaspoon of lemon juice. This mask will not just feel amazing; it will smell amazing, guaranteed! You might even be tempted to eat it! This mask incorporates cinnamon, raw honey, yogurt, and banana to achieve soft, glowing skin. As we’ve mentioned before, banana has a lot of ingredients that your skin will love. The enzymes in banana can promote mild exfoliation, and Vitamins A, B, E, and potassium will hydrate and soften your skin. Raw honey (which can be found at any natural foods store) is great for sensitive skin. It contains tons of beneficial ingredients, including gluconic acid, a mild alpha hydroxy acid which can give you that coveted glow. Cinnamon is the cherry on top of this mask with its anti-bacterial acne-killing properties. You’ll want to mix three teaspoons of raw honey along with half a mashed banana and three teaspoons of yogurt and a dash of cinnamon. Apply for 15 minutes and rinse. While the other masks on this list have aimed to hydrate or to soothe skin, the goal of this mask is purely to exfoliate. The exfoliating properties this mask has are thanks to rice flour. You can buy ready-made rice powder online or make your own by freezing and then grinding rice. DIY scrubs containing sugar can be too harsh on delicate facial skin, so rice flour is a great alternative. It’s very gentle, so it’s safe to use on your face and perfectly suitable for your body. This scrub works really well with oily or combination skin. All you need to do is mix one tablespoon of yogurt with one tablespoon of rice powder. You can use either Greek or normal yogurt, depending on your skin’s needs. You can easily modify this scrub to suit your needs. The ratio of yogurt to rice flour is 1:1, so it’s easy to make either more or less of this DIY scrub. If you want to take it up a notch, add a heaping teaspoon of turmeric. If you would like a thinner paste, add some water. If you want to go all out with your DIY skin care treatments, this face mask recipe is for you. Consisting of rich chocolate, moisturizing honey, and soft yogurt, you’ll look and smell amazing using this mask. We’ve already sang the praises of honey as a humectant and bacteria-killing ingredient, but what about chocolate? Like green tea, chocolate is full of antioxidants, so go ahead and pick up some extra for eating while you’re doing your mask. Antioxidants are great for your skin, and the flavonoids in chocolate may even help reduce sun damage. For maximum effect, use dark chocolate. To make this mask, mix one teaspoon of each ingredient. Melt (but don’t burn!) your chocolate, then add yogurt and honey, and you’ve got yourself one decadent face mask. You need to blend each ingredient well — the final product shouldn’t look too dissimilar to chocolate pudding. Apply to a clean face and leave for 15-20 minutes, then rinse. If you feel like your skin is a little dull lately, brighten it up using this DIY mask. Coconut oil is a common skin care component since it’s acne-fighting and anti-fungal. Coconut oil contains lauric acid, an ingredient that helps kill bacteria and is extremely moisturizing. Lemon juice is also anti-bacterial and can even out hyper-pigmentation. To make this mask, mix half a tablespoon of coconut oil, half a tablespoon of lemon juice, and one full tablespoon of yogurt. If your coconut oil is hard to mix, you may need to warm it up before adding to the mixture. Apply and leave for 15 minutes and rise with lukewarm water. Pro tip: if you have sensitive skin or have previously broken out while using coconut oil or lemon, avoid this mask. Always do a patch test if you’re unsure.